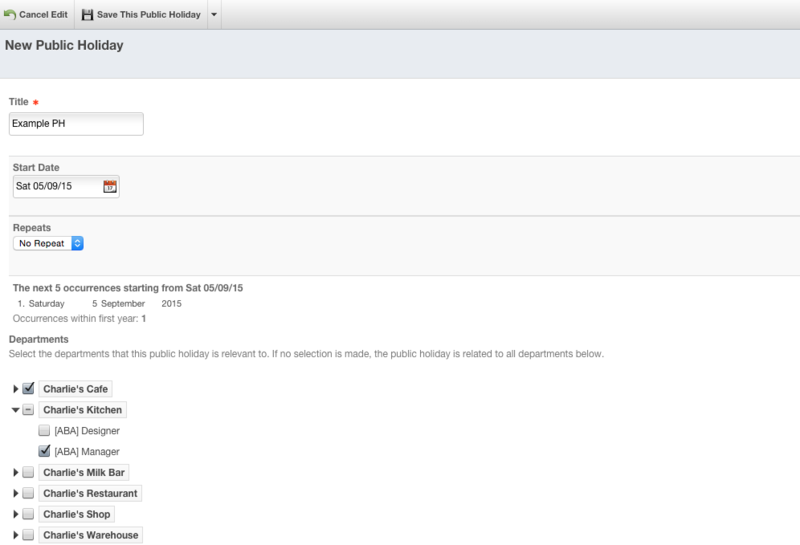 This guide shows you how to set up and create custom public holidays. Welcome! This article will show you how to set up custom public holidays. This is useful if some of your locations have a public holiday and others don't, as occurs on state holidays for example. To create these you must be a system administrator or location manager. You will not be able to access the correct area of the system otherwise. First, please login to Deputy. Next, you'll need to set your URL and add: /exec/administration/public_holiday. As an example, our URL is https://charliescafe.au.deputy.com as shown below. Adjusted, it will read as shown. After changing your URL, hit enter on your keyboard. Doing so will take you to the list of public holidays as shown below. On the left, you will see the possible options. The magnifying glass will allow you to view the Public Holiday, the pencil and paper will allow you to Edit it, and the red cross will Delete it. Viewing a Public Holiday will allow you to see when it was created and by who. Editing it will allow you to change it's name, the day it applies, and which areas and locations it will apply to. To create a new PH, click "New Public Holiday" in the top left corner, which will take you to the following screen. On the creation screen (which is the same as the Edit screen, should you make changes later) you can set the name of the PH, the date that it occurs, if it should repeat (weekly/monthly/yearly), and which Departments (another name for Areas) it applies to. NOTE: If you don't select any departments, it will apply to all locations and all areas. If you select one area (or more) it will apply only to those areas. You can use this to apply it directly to a few areas within a location, and within multiple different locations. Please be aware that if you create a new Area, you MUST come back and tick it here for the public holiday to apply to it. If this is not done it will not be applied. Additionally, if you have marked a PH in this manner please do not mark a PH on your Scheduling page as you usually would. Doing so will override the PH you have created here. After choosing the Departments/Areas this should apply to, hit Save This Public Holiday at the top of the screen. That's it!